September 26th. Today’s destination was the island – and the town – of Hvar, the sunniest island in the Croatian archipelago, with 2,718 hours of sunshine a year (over 7.5 hours a day on average!). 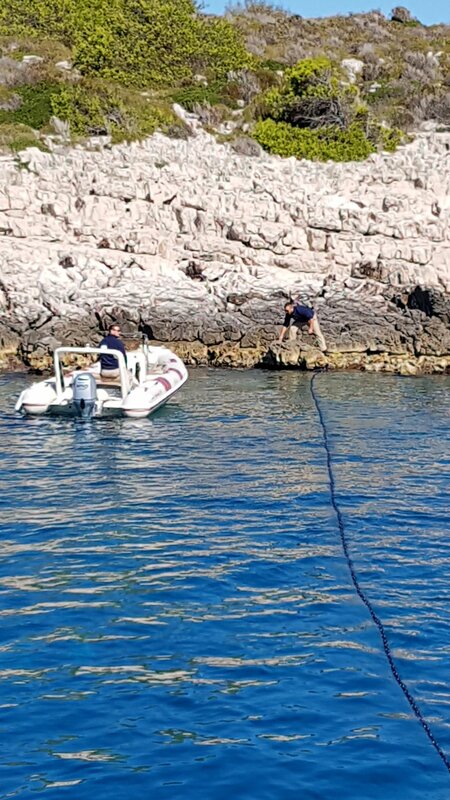 It was a couple of hours sailing from Brač, and, though the bura wind had dropped, we were running before it and its resultant seas, which meant a fair degree of rocking and rolling. This was actually moderately dramatic at times as it had the seating on deck shifting around – whether people were sitting in them or not. and a chap with a motor boat came to take us off for our visit to Hvar town, which enabled a nice view of Perla at anchor. and particularly a splendid view of the fort which overlooks it (and helped protect it during the 16th century). Indeed, it was the fort – Fortica, locally called Španjola after Spanish workers who help build it during the 15th century – which was our first destination as we explored Hvar. Building it started in 1278 and a new fortress – the one which sheltered the inhabitants during a Turkish Ottoman invasion in 1571 – was built on the site starting in 1551.
as well as having on display several artifacts from Greek and Roman times (Hvar’s history actually goes back thousands of years BC). There are also some interestingly-shaped chimneys, reminiscent of the “praying hands” style which we have seen in the Azores. finally arriving at a Benedictine convent, now also a museum named after local poet Hanibal Lucić. The main attraction of the museum is the display of the extraordinarily intricate and fine patterns made by the nuns in Agave (also called Aloe) Lace. The patterns really are breathtakingly lovely. The lace is made with fibres painstakingly extracted from agave leaves, which are graded for thickness and then woven into these patterns using an unusual needle, which has an eye at each end. Apparently, gloves are needed these days to protect the hands of the nuns from an allergic reaction to the oil in these fibres. (I note with amusement that the statue of the boy in the foreground appears to presage modern fascination with social media); and nice harbourside walks with views of the town and fort. after which we just had time for a swift one before dinner. The crew played guessing games with us about the fish which formed the main course. It was delicious, but I think no-one (and certainly not I) would have guessed that it was shark – local white shark, apparently, a fish that grows to about two metres long. Dinner was supplemented by some very nice red wine which our two Australian (and clearly oenophile) group members, John and Greg, had generously bought for the meal, so a merry time was had by all. Tomorrow’s itinerary takes us to Split, and it will be an afternoon visit with different light and hence different photographs from our previous visit. All that will be covered in the next gripping episode. See you there!